Planning a trip to the Green City Under the Sun? Consider booking a room at one of these 10 best 5 star Nairobi hotels. The luxury Nairobi hotels offer uptown luxury, downtown cool, and everything in between. They are sure to make your business or leisure trip unforgettable. Nairobi Serena Hotel is frequently voted as the finest Nairobi hotel. It offers 5-star hospitality in an oasis of calm just 5-minute walk from Nairobi’s Central Business District. Nairobi Serena Hotel has 183 rooms including a wide selection of suites each well appointed with a unique interior design mixing African themes and Moroccan influence with premium amenities. 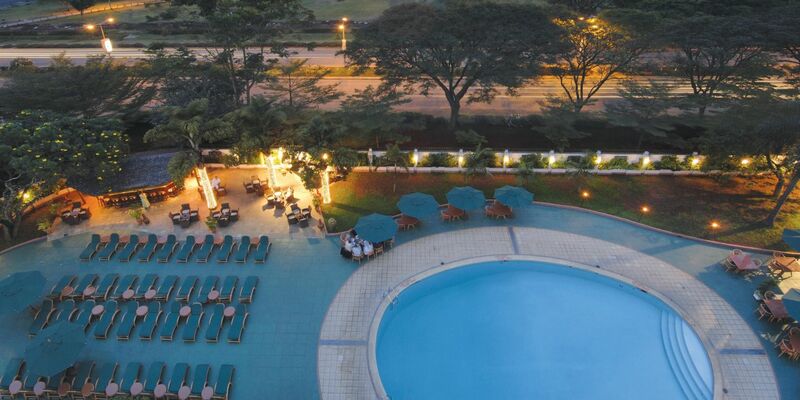 Nairobi Serena Hotel also features a heated swimming pool and sundeck, executive floor, free Wi-Fi and 24-hour room service. The modern hotel offers a world-class Conference Centre and an on-site spa and wellness centre. Nairobi Serena Hotel is home to the renowned ‘Mandhari’ fine-dining restaurant. Villa Rosa Kempinski offers the perfect blend of comfort, elegance and convenience. The luxury hotel’s 200 rooms and suites feature bespoke design, the premium when it comes to furnishings and offer incredible views over Nairobi, the capital of Kenya. All rooms at Villa Rosa Kempinski have complimentary Wi-Fi, a mini bar and in-room safe. Enjoy the facilities of the gym, heated outdoor swimming pool and treatments at Kempinski The Spa. The 5-star Nairobi hotel also has state-of-the-art banqueting and conferencing facilities, ballroom and additional facilities for smaller gatherings. Villa Rosa Kempinski is situated 20 km from Jomo Kenyatta International Airport off Chiromo Road. If you want to enjoy the luxurious amenities provided by the 5 star hotels in Kenya or savour world-class cuisines, then booking an accommodation at The Sarova Stanley lets you achieve it. The Sarova Stanley launched in 1902 becoming the first luxury hotel in Nairobi. It has played host to prominent world leaders, renowned writers, and international celebrities. The Sarova Stanley offers a sauna, swimming pool, rooftop pool, flat-screen TV, fitness room, spacious and cosy rooms among other luxurious amenities. The Sarova Stanley is centrally located in Nairobi’s Central Business District (CBD) at the corner of Kimathi Street. It is located 18 km from Jomo Kenyatta International Airport (JKIA). Fairmont The Norfolk Hotel is one of the first Nairobi Hotels. It was build in 1904 and over the years has been refurbished to give it a modern touch while preserving its traditional charm. The 5-star Nairobi hotel is still the starting point of many safaris. It features tropical landscaped grounds and a range of restaurants including The Ibis Grill and the Lord Delamere Terrace, a popular rendezvous for international travellers and local regulars. Fairmont The Norfolk Hotel offers fine luxury accommodations in its 170 guest rooms and suites, a heated outdoor swimming pool, health club with gym, sauna and steam room. The hotel also offers 8 conference spaces, the largest of which accommodates 200. Fairmont The Norfolk Hotel is situated 19 km from Jomo Kenyatta International Airport off Harry Thuku Road. Sankara Nairobi is certain to delight the business or leisure traveler. The luxury Nairobi hotel combines international 5-star standards with personal service and the authentic flavour of the new Africa. Sankara Nairobi rooms and luxury suits are spacious, feature contemporary style and have genuine works of modern East African art. Sankara Nairobi offers complimentary internet access, stunning rooftop pool and world-class spa and gym. The luxury hotel also offers a tempting choice of dining areas and carefully designed meeting spaces. Sankara Nairobi is situated 21 km from Jomo Kenyatta International Airport on Woodvale Grove. 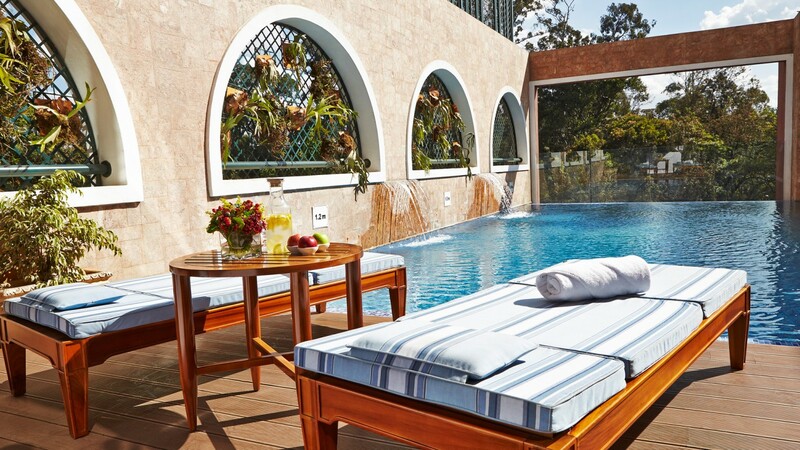 InterContinental Nairobi is an oasis of calm in Nairobi’s city centre. 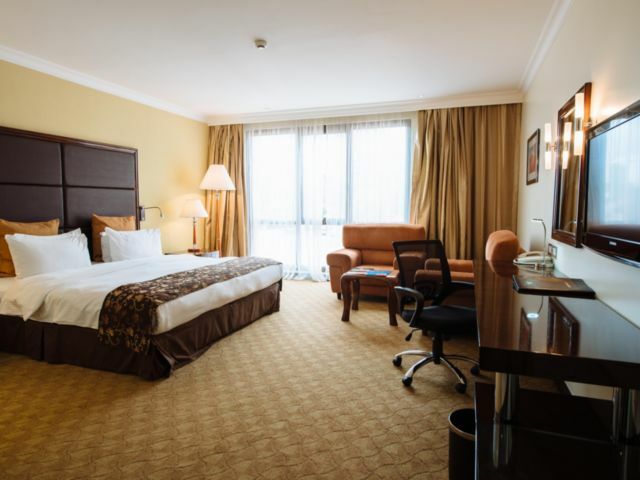 The 5-star Nairobi hotel is ideally located for business close to the Parliament buildings and next to the Kenyatta International Conference Centre (KICC). InterContinental Nairobi offers tastefully appointed spacious rooms with separate living areas. All rooms have king, queen or twin beds. 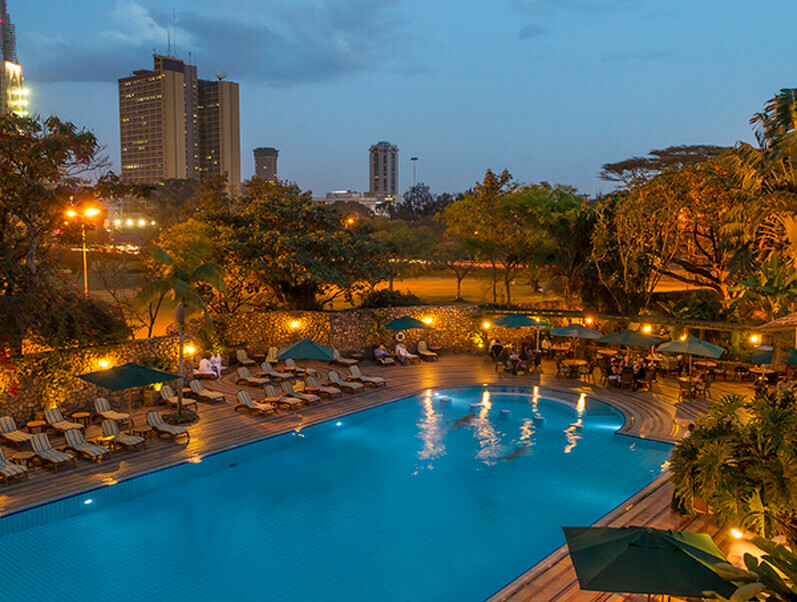 Guests at InterContinental Nairobi have a wide range of dining options, including grilled seafood al fresco on a stunning outdoor swimming pool terrace overlooking Uhuru Park. The luxury Nairobi hotel has spaces ideal for conferences, exhibitions and weddings including a versatile ballroom, which can accommodate up to 700. InterContinental Nairobi is situated 17 km from Jomo Kenyatta International Airport on City-Hall Way. 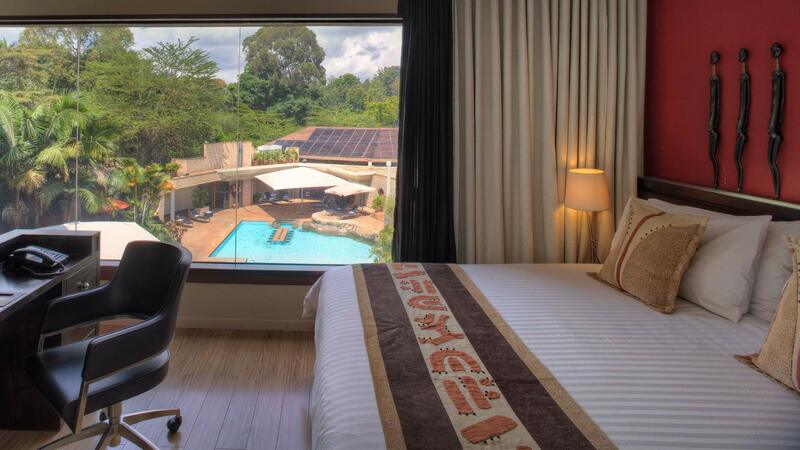 Safari Park Hotel & Casino blends stylishly elegant African architecture with luxurious 5-star accommodation; sparkling water gardens with an inland beach and beautifully landscaped gardens, with a wide choice of international restaurants. The hotel offers a selection of 204 guest rooms; 168 deluxe rooms, 21 Junior suites, 8 Business suites, 6 Executive suites and 1 Presidential. The rooms have large windows, rear and front private balconies and overlook a beautifully manicured garden. Safari Park Hotel & Casino also offers free Wi-Fi, mini-bar, world-class health and recreation facilities, outdoor pool and more than 20 conference and meeting rooms. Safari Park Hotel & Casino is situated 29 km from Jomo Kenyatta International Airport and 10 km from downtown Nairobi. Tribe Hotel offers ultra-comfortable beds in well appointed rooms and suits; 103 superior rooms, 19 deluxe rooms, 5 junior suits, 5 loft business suits, 1 ambassadorial suite, 1 penthouse suite and 1 presidential suite. The luxury Nairobi hotel also offers complimentary Wi-Fi, complimentary mini-bar in every room, outdoor swimming pool, health centre and gym. Tribe Hotel features conferencing facilities, a restaurant – Jiko and the hotels proximity to the Village Market makes it easy to shop for African arts and crafts during the Masai Market. Tribe Hotel is located approximately 25 km from Jomo Kenyatta International Airport and 10 km from the CBD. Windsor Golf Hotel & Country Club offers space and serene ambience in the outskirts of the city. 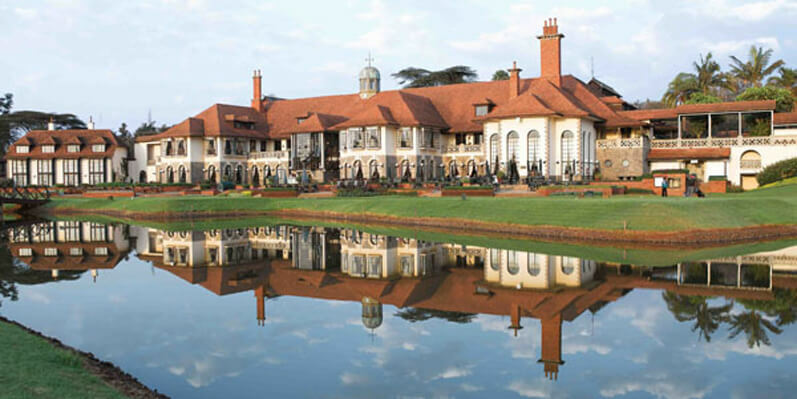 The luxury Nairobi hotel features Victorian style buildings with 130 deluxe rooms comprising of twins, doubles, studio suites and cottages all overlooking a spectacular 18-hole championship golf course. Windsor Golf Hotel & Country Club also offers a 16-hour business centre, free Wi-Fi (for resident guests), jogging track, tennis and squash courts, heated pool, health centre, gym and conferencing facilities. Windsor Golf Hotel & Country Club is situated 45-minute drive from Jomo Kenyatta International Airport and 15-minute from the CBD on Kigwa Lane, Ridgeways, off Kiambu Road. 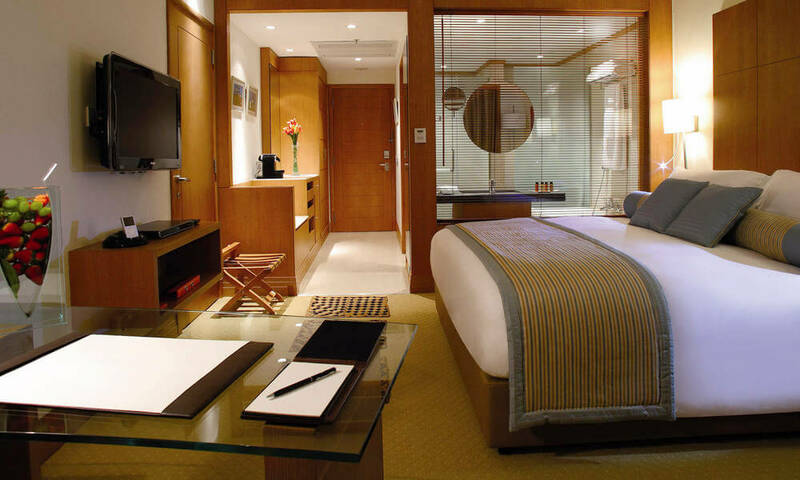 Crown Plaza offers well appointed rooms and luxury suits, complimentary Wi-Fi, a health centre, spa and swimming pool. The 5-star Nairobi hotel also offers a variety of dinning options including the Baraka Restaurant, Sikia Restaurant, Alabaster Coffee Lounge, Babalu’s Lounge or in-room dining. Crown Plaza features state-of-the-art conferencing facilities with a range of meeting and function rooms equipped with the latest audio visual and Wi-Fi equipment. Crown Plaza is located 14 km from Jomo Kenyatta International Airport in Upper Hill, Nairobi.